Abstract. New insights into the synoptic-scale predictability of 25 severe European winter storms of the 1995–2015 period are obtained using the homogeneous ensemble reforecast dataset from the European Centre for Medium-Range Weather Forecasts. The predictability of the storms is assessed with different metrics including (a) the track and intensity to investigate the storms' dynamics and (b) the Storm Severity Index to estimate the impact of the associated wind gusts. The storms are well predicted by the whole ensemble up to 2–4 days ahead. At longer lead times, the number of members predicting the observed storms decreases and the ensemble average is not clearly defined for the track and intensity. The Extreme Forecast Index and Shift of Tails are therefore computed from the deviation of the ensemble from the model climate. Based on these indices, the model has some skill in forecasting the area covered by extreme wind gusts up to 10 days, which indicates a clear potential for early warnings. However, large variability is found between the individual storms. The poor predictability of outliers appears related to their physical characteristics such as explosive intensification or small size. Longer datasets with more cases would be needed to further substantiate these points. 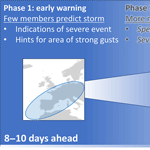 How to cite: Pantillon, F., Knippertz, P., and Corsmeier, U.: Revisiting the synoptic-scale predictability of severe European winter storms using ECMWF ensemble reforecasts, Nat. Hazards Earth Syst. Sci., 17, 1795-1810, https://doi.org/10.5194/nhess-17-1795-2017, 2017. The predictability of 25 historical winter storms over Europe is revisited by taking advantage of a homogeneous dataset of retrospective forecasts for the 1995–2015 period. The forecasts well predict the storms up to 2–4 days ahead only but also show clear potential for the early warning of storms up to 10 days ahead. However, the predictability of individual storms exhibits large variability and physical characteristics are identified for outliers with a poor predictability.